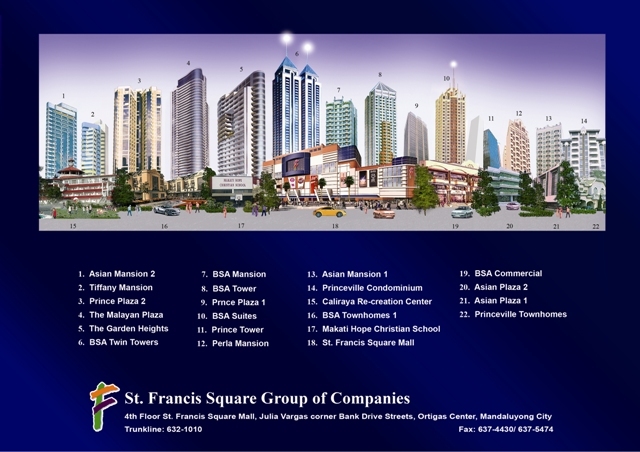 St. Francis Square Group of Companies started with the development of middle income real estate projects in 1980. Since then, SFS Group of Companies started investing in prime Makati properties in Dasmarinas, Bel-Air, Magallanes and San Lorenzo Villages. The BSA Twin Towers lets you enjoy the expansive feel of a relaxing home right at the heart of the city. BSA Twin Towers offer an upscale lifestyle with classic elegance that will unfold each and every day through its carefully-appointed units and other amenities thoughtfully-planned to let you experience life from a different perspective. •	The vertical clearance of lobby is from 3.75 to 4.45 m.
•	2 remotely located and pressurized fire exit stairs from topmost floor to 6th basement. •	Each residential unit is also provided with emergency power for 2 convenience outlets, 1 refrigator outlet, 2 light fixtures. Simplicity and complexity, technology and functionality are combined to create the perfect range of amenities at BSA Twin Towers.